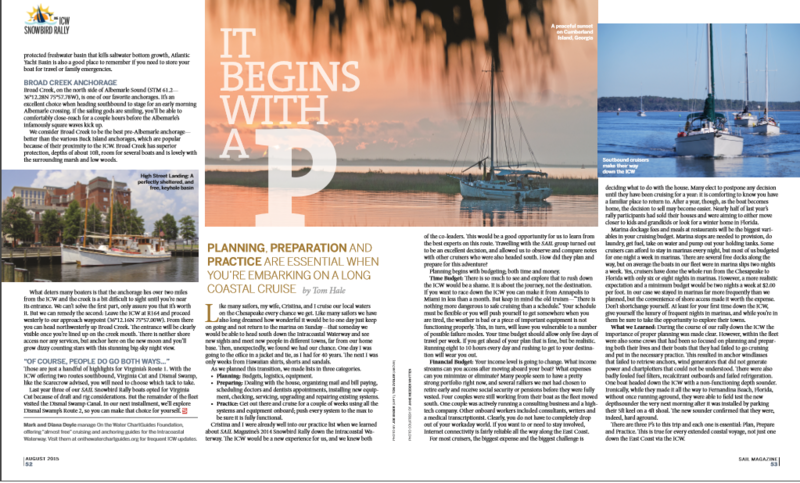 It was great to see my photo accompany the article “Planning Preparation and Practice on a Long Coastal Cruise” written by friend and cruiser Tom Hale, for the SAIL Magazine August 2015 issue. The photo was taken coming through Hell Gate on last year’s SAIL Magazine Snowbird ICW Rally. The Rally began in October at Hampton, Virginia and ended in late December at the final destination of Miami, Florida. Hell Gate is a tricky little spot on the southbound ICW that everyone dreads. It meanders around a sandy peninsula that can easily shoal up. The passage can keep you VERY much on your toes when there’s a four foot or deeper keel under your sailboat that could easily go aground. It’s definitely a time for acute visual piloting, checking the depth underneath you, and keeping a keen eye on the boat in front of you. If you do this, it will give you a big sigh of relief when completely through it. There were many opportunities for birdwatching on the way down to Miami. I think my favorites by far were the Roseate Spoonbills and their pink colored feathers. Was such great fun to see them! What a wonderful captain & crew working cruise with the owners of a 36 foot Gulfstar motor sailboat. The trip was from Vero Beach, Florida to the Exumas in the Bahamas. While spending a few days in this area, we took a break for a quick trip with the dinghy over to a tiny secluded island nearby where we had anchored. After we beached up the dinghy, we took time to investigate the shrubbery with tiny unknown fruits and small birds. It was then that I took this photo. After returning back to the U. S., it was submitted to Cruising Outpost magazine and their Facebook page. Much to my surprise they liked it so much that they published it in an upcoming magazine issue! What a great surprise indeed! 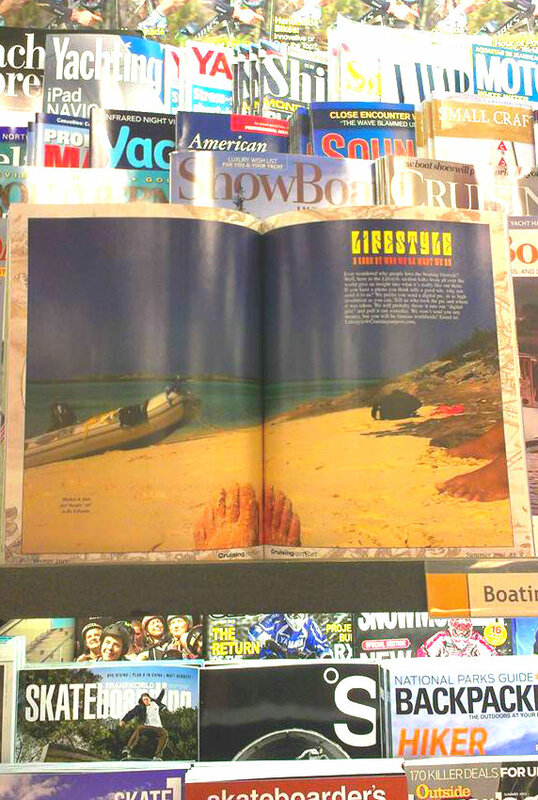 Featured photo spread in Cruising Outpost Magazine, Summer 2013 Issue 3.